This 4.5 bedroom character filled cottage, has only just gone through a complete make over where the inside was gutted and replaced with modern facilities and furnishings, but we have definitely kept the old world style being Retro which has a delightful charm and feel to it. This is a classic property, which perfectly represents the type of bach the grand parents used to have, many of you may remember such a place in your youth, where as kids, we loved the situation of being able to spend all day on the beach and run home without having to worry about sand on our feet or being told off by the oldies for making a mess. Drop Anchor is one of very few properties remaining in that original state, a real classic gem and now also very comfortably appointed. It has 4.5 bedrooms and 2 bathrooms. The bed configuration has the Master bedroom with a California King bed in a large room which opens onto the wrap around covered deck, with the view across the Bay. The second bedroom has a split king bed. and the third bedroom has a King single bed..
Just behind the back door is the sleep out, which has a double and single in one room and the second room is baby size. The kitchen is completely remodelled with gas oven and hob, dishwasher, micro wave and fridge freezer, along with being well equipped with most everything you may need to whip up the great meal.. We have kept the cupboards as they were, although repainted, they are still the same colour. The living /dining room are open plan, with a large hand made table and benches, and the lounge has all new furniture. A 40” TV is on the wall equipped with Sky channels, and there is Wifi as well as stereo which has a USB connection for smart phones. We offer outstanding accommodation! Whether it be for your family visit to Waiheke, a corporate off site retreat, or that special wedding / honeymoon accommodation, we have the solution. Waiheke Unlimited, has been in business on Waiheke Island for over 20 years, and our exclusive portfolio are properties which I have personally selected and priced according to what I would be happy to pay. 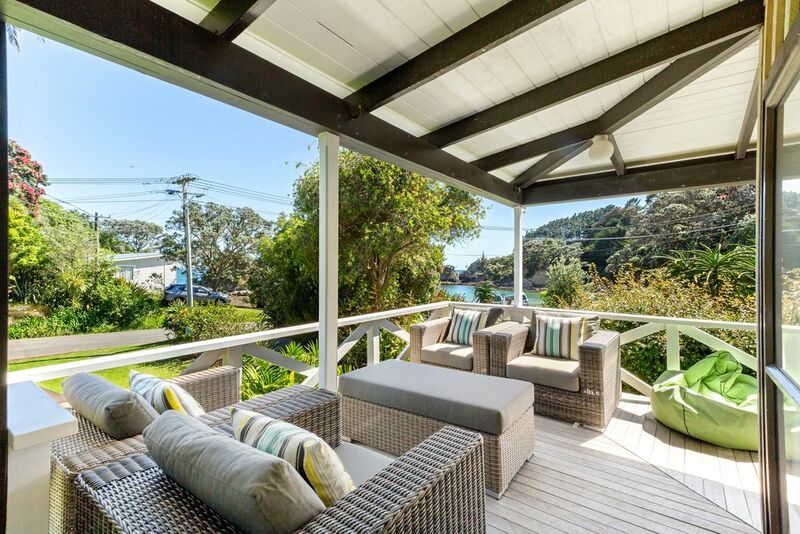 They are located in Oneroa, Palm Beach and Onetangi, and offer the best Waiheke holiday homes within their categories of Luxury Estates, Premium Holiday Houses, Quintessential Kiwi Cottages and our 1, 2 and 3 bedroom Palm Beach Villas. As one of New Zealand's premier wine growing districts, you can enjoy a day of wine tasting or, alternatively, sample some of Waiheke Island's famed gourmet cuisine. If you're feeling in the mood for some outdoor activities, Palm Beach is a stunning beach and safe swimming, or try your hand at some great fishing. The island of Waiheke lays 20 kms east of Auckland in the Hauraki Gulf, belonging to the North Island of New Zealand. It is the largest of the forty or so islands within the Gulf and has 96 kms of coastline. Initially named Te Motuarairoa - the long sheltering land - Waiheke's modern name means "cascading waters" a reference to the waterfall located within the Whakanewha Regional Park. Wonderful location - very nice safe rocky beach as long as you wear beach shoes as the rocks are very sharp and we all cut our feet badly the first day. Very well equipped kitchen - 2 of the bedrooms are on the small side. Great spot, we anchored our boat in Sandy Bay and walked to the property. Great spot, we anchored our boat in Sandy Bay and walked to the property. House was clean and had everything we needed. Good having the sleep out as extra accommodation. Was nicer than we expected. The house suited our needs very well. The house suited our needs very well. It was clean and comfortable and the view was beautiful! There is plenty of seating on the porch as well as inside the house. The kitchen is well equipped and the shower works great. One oddity is that the beds are on wheels so if you want to sit up and read in bed, you may find yourself travelling across the room. The only negative is that the washing machine is complicated to figure out; the plumbing is hooked up to the sink in a unique way. You will be happy to know that we have measured up for both window screens and Nets, so you will be able to return, and not get bitten. Maybe we will get that 5 after all. Cheers, Ed. As one of New Zealand's premier wine growing districts, you can enjoy a day of wine tasting or, alternatively, sample some of Waiheke Island's famed gourmet cuisine. If you're feeling in the mood for some outdoor activities, Palm Beach is a stunning beach and safe swimming, or try your hand at some great fishing. The island of Waiheke lays 20 kms east of Auckland in the Hauraki Gulf, belonging to the North Island of New Zealand. It is the largest of the forty or so islands within the Gulf and has 96 kms of coastline. Initially named Te Motuarairoa - the long sheltering land - Waiheke's modern name means "cascading waters" a reference to the waterfall located within the Whakanewha Regional Park.